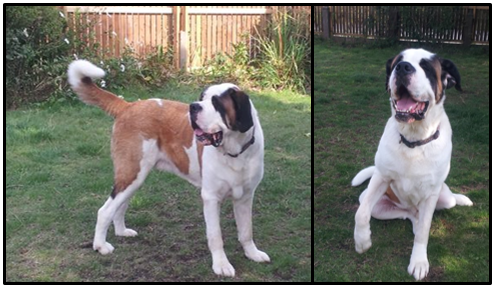 The penultimate post, week 7; covering some basic titbits about the breeds. This will be in between other posts too. This, the seventh, post will cover S-V of dog breeds. In previous posts, A-C, D-F, G-I, J-L, M-O and P-R have been covered. Almost done with my A-Z of dog breeds, with 1-3 breeds covered per letter. Country of Origin: Italy and Switzerland – the Great St. Bernard pass linking Switzerland and Italy has a monastery/ hospice where monks used to keep this breed as guard dogs. Original Use: Guarding the monks in the monastery/ hospice. and being companions and search and rescue dogs, for the monks. These dogs would act as search and rescue in the mountains and the pass. The dogs are said to have been acquired firstly during the mid-late 1600’s – with their excellent sense of direction,their brilliant ability to navigate through dense fog and snow storms, and the sensing an impending avalanche and being able to warn the monks prior to it happening; the dogs always accompanied the monks out in the mountains and the pass. 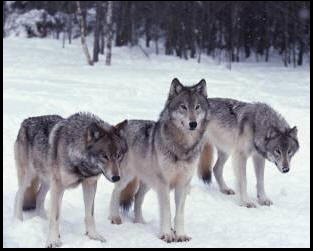 Later on, the breed was used on farms and dairies for guarding, herding, and drafting. Outstanding Physical Trait: Aside from its’ sheer size, the breed has quite a distinguishing colouration – the white face, chest and underneath; the dark ears and eyes (and often around the nose) and the lighter back to tail, down the back legs markings. They are also quite jowly and do slobber a bit! Original Use: Bred for bull baiting, bear baiting and dog fighting. Unfortunately, all too often they are still used for dog fighting. They are also used as “status symbols” by gangs and owners who want to appear tough – they often encourage negative behaviours in their pet and treat it poorly, and do not train the dog well; allowing their pet to behave how it chooses. Dogs will choose to behave in the way that gets a positive response from their owner (meaning the dog will behave aggressive if the owner encourages this) – which has led to this breed getting a bad reputation, and often people avoid them due to the minority of bad owners. Behaviourally, any breed will behave negatively if encouraged, it just seems to be bull breeds that bad owners choose to corrupt. In my personal experience with this breed, they are lovely with people – very loyal and good with families, but often do not get on with other dogs (some do, but most I have worked with strongly dislike other dogs) – this could be due to the centuries of being bred to be aggressive to other dogs. Original Use: Simkhyi is what the Tibetan monks used to call them – meaning “house/ room” dog – the original use was purely a small companion to live in homes with people. Originally bred by monks in Tibetan Monasteries, but also, in time, kept by wealthy nobles. Outstanding Physical Trait: One of the smallest breeds of spaniel – this and the Japanese Spaniel (Japanese Chin) are the 2 smallest spaniel breeds, then the Cavalier King Charles Spaniel. Other spaniel breeds include the Springer and the Cocker – 2 of the more popular spaniel species, along with the Cavalier King Charles – which all have quite typical spaniel features – long coat, long tail, long and floppy ears; the Tibetan spaniel has long (ish fur), short and floppy ears – which also can stick up, and a little tail that curls around, atop its’ back. It has its’ own little look, not typically spaniel! Country of Origin: Germany – defined into various breed standards alter in France. Originally called the Pudelhund – meaning “puddle dog” in German. 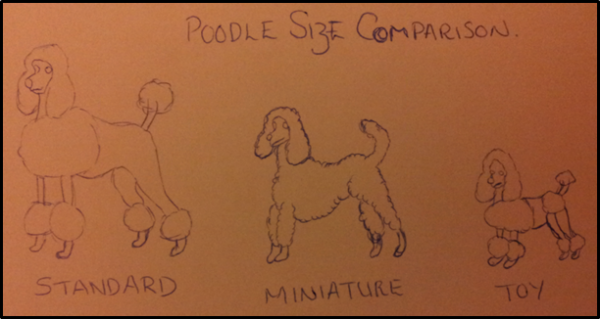 Then translated into poodle (puddle). It is also the national dog of France, despite not actually originating from there. Original Use: The larger of the breed were used as gundogs, to retrieve and flush out game – often getting in the water a lot (hence the “puddle dog” name). The smaller breeds were used for sniffing out truffles, and later in circuses for entertainment. Outstanding Physical Trait: The typical French Poodle cut – pom-poms and fluffy ears and head (pictured below, left). Original Use: The Utonagan has been bred to be a wolf-like breed, and is to resemble the wolf as closely as possible without containing any wolf DNA whatsoever – it is purely domestic dog; no crossing with wolves or other wild canines. It is a mix of the Alaskan Malamute, German Shepherd, and Siberian Husky. This breed is fairly new, having only been developed during the late 1900’s! 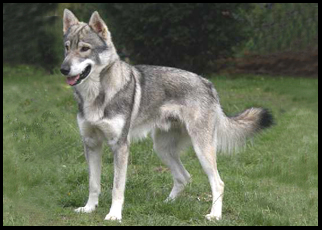 The breed was developed by crossing the Malamute and Husky, later crossing the offspring with the German Shepherd. The breed has been bred as its own breed, without the use of the previous three breeds, since the 1980’s. Outstanding Physical Trait: The wolf-like look and colouration with long sleek fur and wolf-shaped face/ muzzle, and pointed ears – even without the long fur it bares a strong resemblance to its’ relative the Grey Wolf. Not unlike the Eurasier, however Utonagan is not a spitz-type of dog, which is clearly seen in the face of the Eurasier – the Utonagan has a more wolf-like face. The Long Haired Utonagan is fluffier than the European Grey Wolf, whereas the Short Haired bares more of a resemblance coat-wise (pictured below). Original Use: First referred to as a breed in the mid-1300’s, but not established as an official breed until the 18th Century. A dog of the aristocracy used as a gundog – tracking, flushing out and retrieving game – used for this as early as the 14th Century. The name comes from the Hungarian word Vis – meaning, “to search”. Outstanding Physical Trait: The unique russet-gold colouration is the only colour this breed comes in. Sometimes white flecks may appear on the coat, but primarily the Vizsla is russet-gold, including its’ nose!